Go get some rest pretty mama! Love this outfit! I love the long skirt look, in a casual, day-to-day, pairing! Very cute! But such a cute outfit! I always say, simple is best. ohhh... baby love! giggles are the best! have so much fun with your family! Love the outfit! and Congratulations to your sister! I think she might know my friend--he graduated from Basic today too somewhere in the South. haha awh, you'll have to post a video of everett giggling sometime :) He's the cutest! aww, can't wait to experience late night baby giggles. how adorable! and of course you look great too!! love that skirt! you need the rest!! super cute outfit! you pull your outfit off so well! you bub is so gorgeous! love hearing about him! You are the queen of floor length maxi skirts. I need to get a straight, solid one like this. You are one stunning momma! Just bought the skirt. Thanks for directing me to it! Gorgeous! beautiful! hope he gets to bed soon for you mama! Super cute syd! Get some rest! PS; I'm having a giveaway for new moms and moms-to-be! I'd love it if you checked it out! You look really lovely. Hope you get a good nights rest. 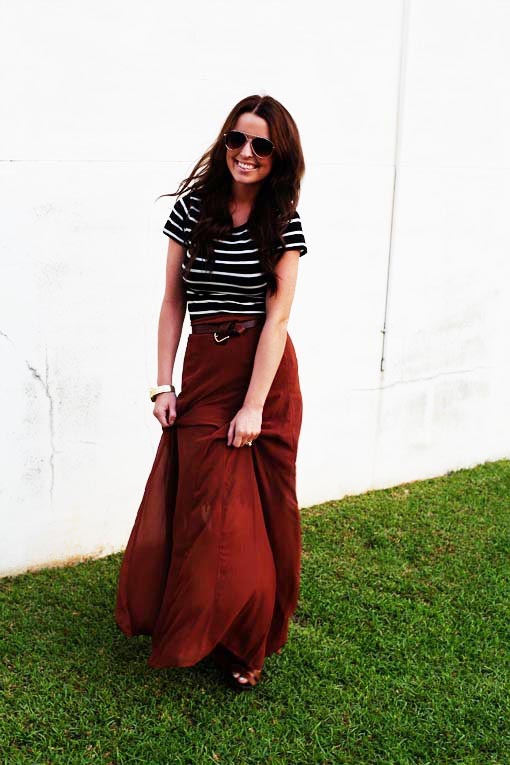 Such a sweet outfit, love stripes and maxi skirts. horizontal stripes with a belted high-waisted skirt. you're speakin' my language. fun outfit! enjoy your time with the fam! Alright that's it. I'm getting myself a maxi skirt... tomorrow. I LOVE this outfit. Anything stripes is my fav! Okay, your hair is to die for. Just sayin'. I loooooove your top! Been looking for one like this but have yet to find it. Maybe this is a sign I'll find it soon :). Great outfit. Great outfit! Love the maxi skirt. Nordys has the best maxi- dress/skirt options. awwwwww i love when my baby lays there and entertains himself w/ giggles hehe!! Love this outfit! 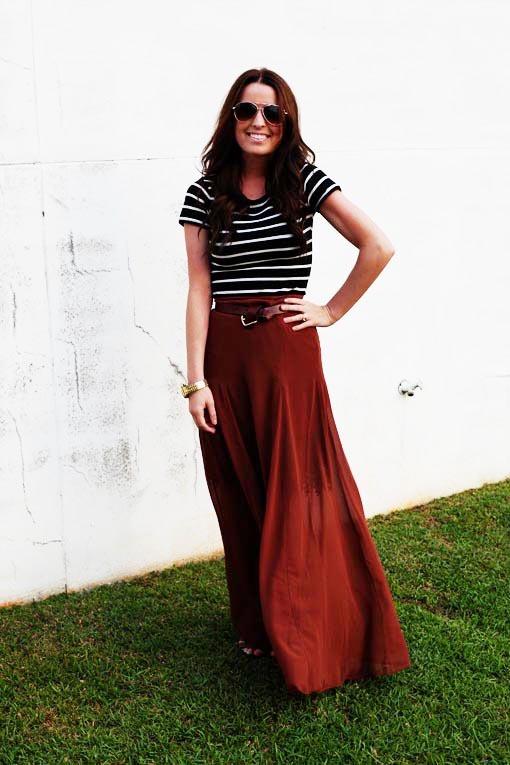 The maxi skirt looks so good on you! LOVE this outfit. That skirt is so pretty and looks amazing on you! You are ROCKING the outfit Syd! Love it! Aww, you are such a doll, Syd! I love this look :) Despite the dark colors, your cheerfulness still shines through. I really like this outfit. It is so beautifully effortless. 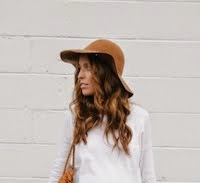 I love everything about this post from your outfit to the mental images of a giggling baby! I love your outfit! The combination looks so well! Love this skirt!! So fun and such a great color! This makes your teeny tiny waist look teenier and tinier! Oh no! I always wanted to the army! You've been rockin those maxi skirts Girl! You have no idea how much I love this outfit.You are really beautiful. I LOVE this outfit! Mormon girl to mormon girl, are you wearing a slip under your skirt? I have been looking for a place to find cute slips! So many cute skirts and dresses are so thin lately! Where do you find yours?